Aracea includes approximately 108 terrestrial, epiphytic, and climbing herbs plus a few aquatics, which are widely distributed in tropical and temperate regions. The flowers are greatly reduced and crowded onto a cylindrical spadix, usually surrounded by a bractlike, often showy, spathe. Some temperate apeciea are familiarly known as jack in the pulpit. Tubers of some species are eaten as starchy vegetables in the tropics after cooking. Fully ripe compound fruits of Monstera deliciosa are edible fresh, a sweet – tart blend the texture of bananas with a fragrance of coconut and pineapple, a ready – made pina colada. Leaves are usually simple, often lobed or variegated. Some apecies produce adventitious roots for climbing. Flowers are bisexual. or unisexual with male and female flowers on the same plant or occasionally on separate plants. The fruit is usually a red or yellow berry or syncarp. The sap often contains oxalates, which can cause burning inflammation of the skin or serious swelling of mucous membranes if eaten. Sodium bicarbonate as a paste or in water is an excellent first aid to neutralixe the burn. Other poisonous compounds are often present. 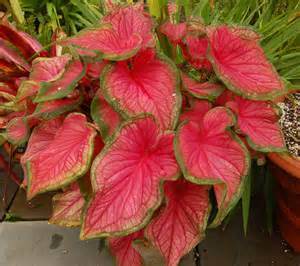 Caladium includes approximately 12 species of seasonally dormant herbs from South America and the West Indies. Many selections are cultivated for their brightly marked leaves. The leaves are ovate or hastate. Markings range from scattered spots to mottled color zones. Flowers are unisexual, the female flowers below, male above on the same inflorescence. The sheathing spathe enfolds the spadix and is constricted below the middle. Cultivated plants of uncertain ancestry involving C. bicolor should be referred to collectively as C. Xhortulanum. The genus has been revised several times, but the standing of various forms and taxa is still unsettled. In temperate zones the ovoid tubers are lifted and stored indoors in winter. The sap may be irritating. Synonym: C. bicolor (hort). Garden origin. Seasonally dormant herbs to about 2 ft, zones 10-11. Blooms warm months. Regular moisture and humidity during active growth, dry when dormant, Fertile, well – drained soil, slightly acid pH. Full sun to part shade. Flowers: Unisexual, spadix green or white, spathe greenish white or variously spotted, constricted near the middle. Leaves: hastate to lanceolate, green variously marked red and white usually peltate. Excellent for color in shady spots where many flowering plants will not bloom but also adapts to full sun with adequate moisture. Colombia. Seasonally dormant herb, 1-2 ft, zones 10-11. Blooms spring, Regular moisture and humidity during active growth, dry when dormant. Fertile, well – drained soil, slightly acid pH. Full sun to part shade. Flowers; unisexual, spadix green, spathe white. Leaves: sagittate, veins white, midvein hairy, petiole attached to margin, not peltate.